This is an amazing accomplishment! Of the 65 Hall of Fame members, our school is proud to be represented by 38 faculty and alumni. As dean, I am honored and thankful that so many Husky Nurses serving as the driving forces for creating healthy communities, locally and globally. The Washington State Nurses Association unveiled its Hall of Fame in 1996 to recognize the dedication and achievements of Washington State registered nurses who have made significant lifetime accomplishments in the nursing profession. 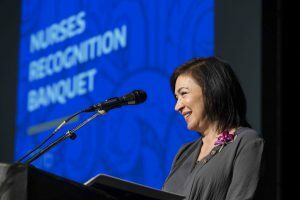 Each inductee into the Washington State Nurses Association Hall of Fame has demonstrated excellence in the areas of patient care, leadership, education, public service, nurse advocacy, heroism, patient advocacy, or clinical practice, and for achievements that have value to nursing beyond the inductee’s lifetime. In addition, each has demonstrated excellence that affected the health and/or social history of Washington State through sustained, lifelong contributions. Please join me in congratulating these remarkable nurses!